Wendy Evans (left) and Kaitlin McDaniel, from MU’s College of Veterinary Medicine, present their plan for House Collars Concierge Vet Techs during the Idea Competition at SAVMA Symposium 2017. Wendy Evans and Kaitlin McDaniel took a business concept to the 2017 Student American Veterinary Medical Association (SAVMA) Symposium and came home with a second-place finish and $5,000 in seed money. 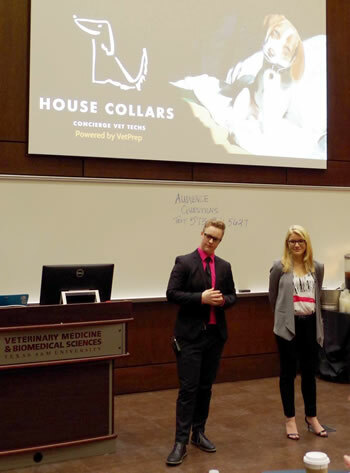 Evans and McDaniel, third- and second-year students, respectively, at MU’s College of Veterinary Medicine, presented their concept for a business venture they call House Collars Concierge Vet Techs during the Idea Competition at the symposium, hosted by Texas A&M University. House Collars plans to offer skilled, professional home care for companion animals. The concept and business model for House Collars revolves around a medical bag, the historic symbol of a medical professional who becomes part of a community by going into its neighborhoods to provide care. The business will serve as an adjunct to the veterinary practices that oversee the care of client pets. “If a veterinarian diagnoses an animal with diabetes, for example, the pet owner would pick up the syringes and insulin, and then our technicians would administer it,” Evans explained. The two partners are working on their doctors of veterinary medicine, but have always been interested in the business world. “Kate is also the current national vice president of the VBMA,” added Evans, who hails from Springfield, Missouri. A visit to Evans’ parents in Springfield provided a moment of clarity. After outlining the types of services suited to in-home care, the partners turned their attention to identifying their potential customers. “We started thinking about the different kinds of demographics or customer archetypes that would have struggles keeping up with their pets’ health maintenance,” Evans stated. Home care offers obvious advantages to pet owners: they can avoid traffic, time away from work, crowded waiting rooms, and feeling like a number. Instead, they can enjoy safe and simple access to care and personalized service in the comfort and privacy of their home. Home-care practitioners benefit too, from low overhead and freedom from the confines of an office. The House Collars entrepreneurs also see benefits ― not competition ― for veterinarians, citing workflow efficiency, team advocacy, a higher level of compliance and fewer chances of harmful complications. They say veterinarians could see additional pet referrals, because House Collars will encourage pet owners to visit a clinic, and to keep their follow-up appointments via a reminder service. Regular visits can allow veterinarians to detect diseases earlier, leading to healthier pets and a healthy pet practice with more time for other clinical services. The entrepreneurs behind House Collars will themselves become veterinarians, but will concentrate on managing the business while registered veterinary technicians make the house calls. The business positions itself as “concierge vet techs,” and the partners say the techs are another group who stands to benefit from their business. In addition to their academic gifts and business acumen, it would seem the women possess a talent for time management.